22 Mar Belta & Frajumar changes its skin! Would you like to see this premiere? 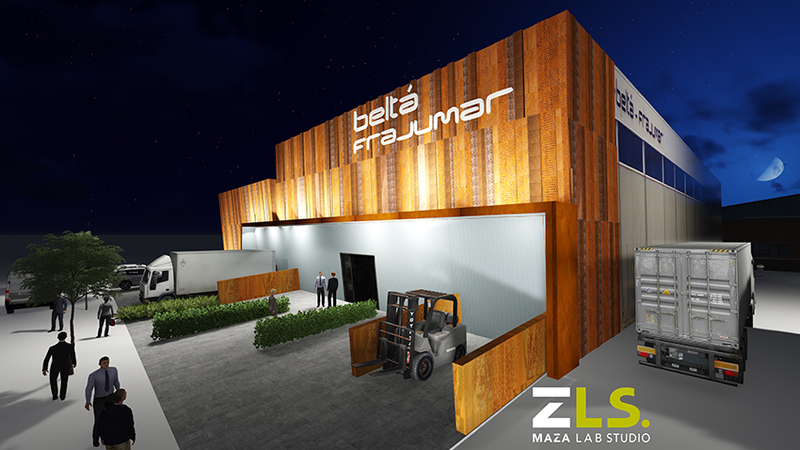 ¡Belta & Frajumar changes its skin! According to the new aesthetics by Group Belta & Frajumar, we want to show you the Premiere of the new façade of our facilities. Lifting works have already begun and will be completed imminently. The work of architecture and interior design carried out with our new showroom, recently inaugurated, is evident now also on the outside of our facilities. The aesthetic concept has been developed by the architects of Maza Lab Studio and they have decided, in words of one of its leaders, “to upholster an upholstery factory”. Upholstery, according to the RAE (Royal Spanish Academy), is “covering or coating a surface with something, like covering it with a tapestry”. It is a term that has been used to describe the action that will be carried out in our facilities. The new exterior image of the company will be our business card to advertise the new services we are already offering for integral projects of Interior design and contract, both domestic and international. The new envelope generated for the facade is able to adapt to the differences in the current one, which is composed of three naves, fruit of the previous enlargements of the factory. This new façade will be carried out with a material which allows a unification of visual, as well as modulate the entire façade and it offers a set of textures that can generate a changing facade in time. He opted for a material that can adjust the vision from the outside and serve, also, of sunscreen for the interior. At the same time, there is the will to optimize by 60% the weight of substructure of a metallic enclosure… Is for this reason that it opts for steel cut as working material with three measures of different width and three coefficients of drilling. In addition to all of the above, joins a new visor that unifies the four loading docks which weekly caters to the factory of material and which is also all our production. This visor’s large scale projects and is designed as a largely backlit label. In short, it is to consolidate the current façade keeping current brands Frajumar, Belta and Frajumar & Belta parallelism with the consolidation that are experienced in recent times. We are moving ahead!